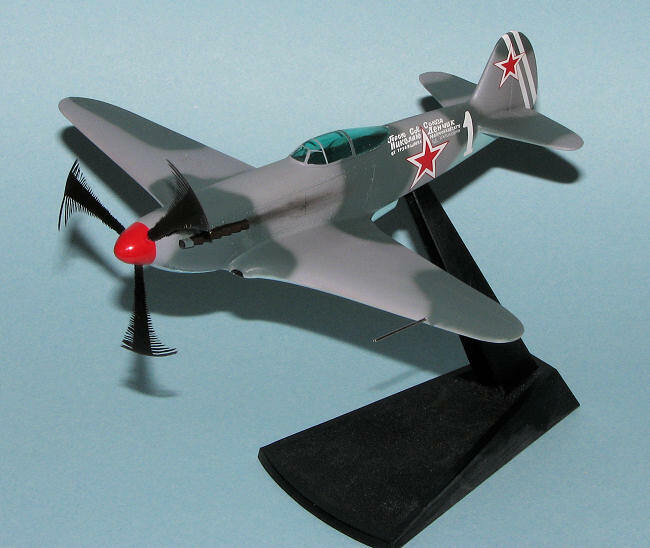 Lighter and smaller than Yak-9 but powered by the same engine, the Yak-3 was a very agile dogfighter and a forgiving, easy-to-handle aircraft loved by both rookie and veteran pilots. Early combat experience showed it to be superior to all Luftwaffe fighters at altitudes below 5,000 m (16,400 ft). It could roll with the Focke-Wulf Fw 190 and its turn rate was almost eq ual to the Bf 109. Visit the preview for a look at the bits that come in the box. There aren't many. Construction begins with the cockpit........ha,ha,ha. There isn't one so actually, construction begins with rescribing the control surfaces. I used the UMM SCR-01 that I previewed a few months back as I'd never used one of these. It was simple enough to follow the extant raised lines, though I think I applied too much pressure to it. Those that actually want straight lines will want to use embossing tape or something else as a guide. I then started cleaning up all the mating surfaces. This thing does have alignment pins, but they will cause misalignment so off they went. I glued the fuselage halves together then the wing halves. When dry, these items were mated to each other. I also glued on the spinner after cutting off the prop blades. Were I smart, I'd have drilled the holes for the Prop-blur right then, but I'm not so I didn't. These items then were liberally smothered in Tamiya filler as the gaps were somewhat large. This was especially true at the underside of the wings. Much sanding an d more filler later, things were properly smoothed out. I also filled in the gap between the prop spinner and the fuselage. The wing leading edge intakes were quite crudely done so I made an attempt to make them more oval in shape. Not totally successful, but better than before. More filler and the tailplanes were attached. Did I mention more filler? Sanding all this down was quite theraputic and eventually I had it all done. 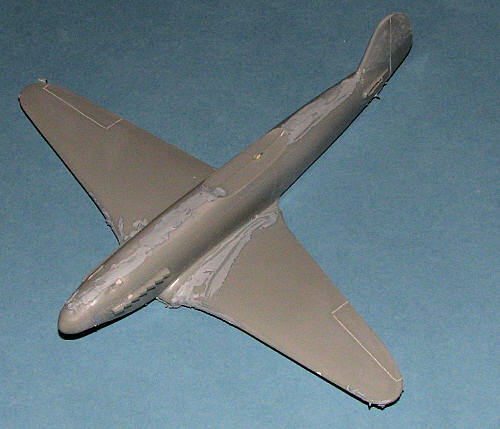 The last piece to add was the lower fuselage radiator. Filler anyone? More sanding and finally it looked nearly ready to paint. I thought about painting the inside of the canopy with a dark blue, but thought better of it. The canopy did not fit very well so out came the mini grinders to slough away more plastic to get a better fit. Once that was nearly achieved, I painted the cockpit area black and started masking the canopy. This has no real frame lines to follow. There is a single line that shows where frames could be and so I masked a bit away from either side of this line. The canopy was then attached using clear paint. Now time to paint. Of course, the kit's instructions were little help and I certainly wasn't going to use the kit decals. The star I tested in water broke into sub-atomic components so were not usable. 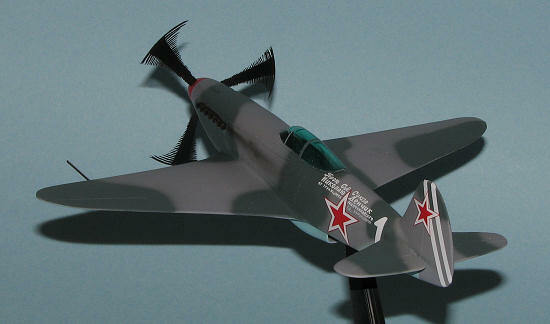 I searched around for a nice Yak-3 scheme and found one that was pretty simple. It was the plane of Major Nikolai Fedorovich Denchik who was commander of the guards unit 'Order of Aleksandr Nevskii' IAP, 4 GIAD in the Baltic during 1944. Denchik had 19 victories. 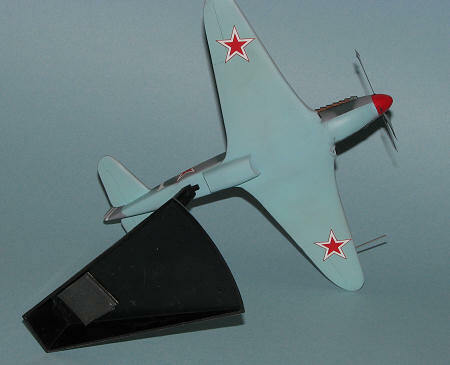 His plane was AMT-11/12 upper with AMT-7 undersides and a red spinner. Simple enough to paint and I used Colourcoats enamels for these shades. I also used the Aztek 480 airbrush to hand paint these colors. The airbrush did a fine job on all the colors and even did OK with the camo demarcation lines. I've still not figured out how to get a really tight line with this airbrush, but I learned a lot about its use, one of the reasons for building this kit. Not surprisingly, the markings were all rather oversize so some adjustment did have to be made. However, if I hadn't told you they were too big, you may not have realized it. These came from old Aeromaster sheet 48-642, "The Russians are Coming part 2". With the markings in place, the airframe was given a wash to remove any setting solution residue. I then drilled the holes for the Prop-blur. I used a large spinner from another kit to provide the proper angle by placing the spinner over the one on the Yak to determine hole placement. I also trimmed back the Prop-blur as they were too long. Initially I cut one at the top, but it just didn't look right so cut the next at the bottom. That was more the ticket so I did the same with the other two. These were then glued in the holes drilled in the spinner, being sure they were shown rotating clockwise as looking from the front, as the Klimov engine rotated in that direction. These were then painted matte black. The airframe was then given a coat of matte clear acrylic, using my time tested mixture of Future and Tamiya flat base. Then I took away the masking from the canopy and to my amazement, it looked just fine (aside from the usual area where the masking lifted slightly during painting). A bit of trimming was done to the attachment point on the base to keep the plane from setting 'nose down' and the model was attached using super glue. It proved to be nose heavy no matter which direction it faced on the base so I settled on one pose and glued some weight to the underside of the back of the base to make it more stable. The exhaust were painted with Vallejo's Tinny Tin as it looks like Burnt Iron and is easier to apply. A section of stainless tubing was used for the pitot tube and I used some pastels for exhaust stains. That was it. OK, I know that most of you would not waste your time on something like this so I figured I'd do it for you. It isn't going to win awards, it isn't even a proper scale, but it does look nice on the stand and I'm glad I took the time to build it, despite all its faults. Besides, it aroused the cheap in me and for $5 (ok, make that $12 as I had to buy the decals), it is a bargain. Thank you to Testors, UMM, and Prop-Blur for providing their materials used in this article.